BDSL's Premier Champs Crowned WNYSA Amateur Cup Champions. 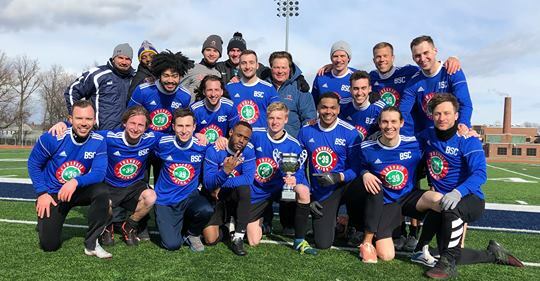 The BDSL's Premier champions, BSC Raiders defeated the RDSL top flight champs, the Westside Wankas 3-2 in overtime on a cold windy day at Sparky Adams Field. The win earned BSC their first trophy of the 2019 season and crowned them the WNYSA Amateur Cup Champs alng with giving them the Region I Amatuer Cup berth. They'll now travel to Maryland to face the winner of the Marlyand Majors Stewart Cup. That turnament is in its final stages with the winner to be revealed soon. BSC will head down on April 7th for the Amateur Cup game and then return home to face Eastern PA's Philly Lone Stars on April 14th 2pm at Sweet Home HS in the Region I Open Cup.